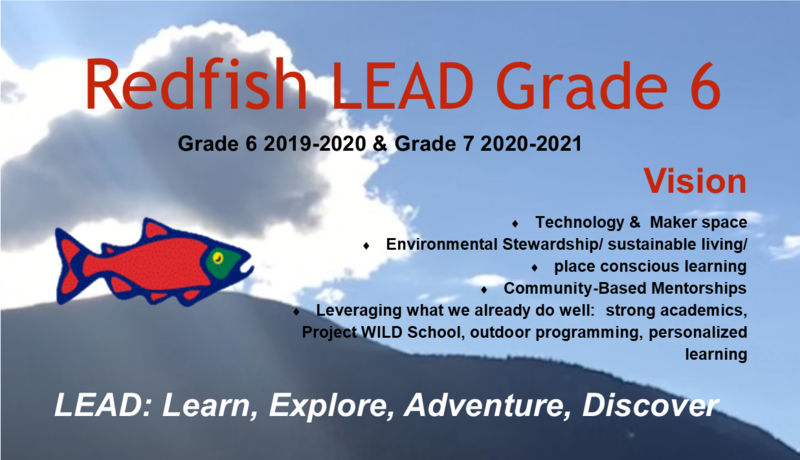 Starting in September, 2019 Redfish Elementary School on the North Shore is adding Grade six with Grade seven in 2020. The school is excited that next year the Grade 6 students will be taking a leadership role in our school. The current Grade 5s are co-creating what they call the LEAD (Learn, Explore, Adventure, Discover) Program, with a focus on outdoor and experiential education. They have chosen to design and build a gazebo and garden in our big playground as their major project. They will also have the opportunity to work with community mentors on passion projects through the year. And because Redfish is a Wild School, they will continue to build on their years of learning in the forest, along the spawning channel right across the road, and at the lake, which is just a three minute walk from our front door. Redfish is grateful to be in a community that fully supports our students' learning in a myriad of ways. Just one example is that we have a PAC Accounting Club, where an accountant comes in at lunch and teaches a group of truly eager students all about our PAC accounts and all of the checks and balances needed to have a rigorous bookkeeping system. Redfish also has artists, coaches and chefs coming through the doors weekly. Community members are welcome to stop by our beautiful outdoor classroom by the spawning channel to walk the trails.